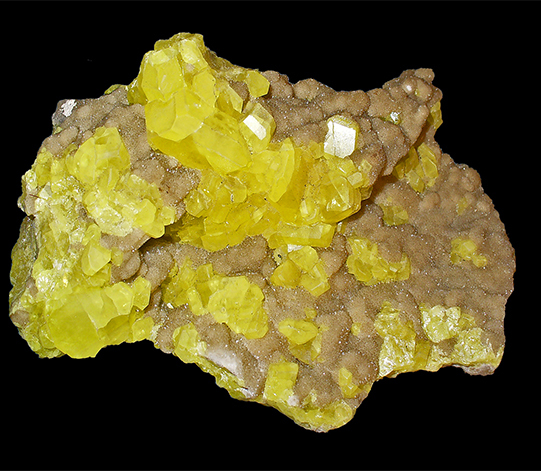 Brimstone, or sulfur, occurs as condensate deposits at remnant volcanic fumaroles in the Jordan Rift Valley. The Bible references minerals and metals more than 1,700 times, using such familiar phrases as “fire and brimstone,” “pieces of silver,” “copper from the rock,” “salt of the Earth,” and “jars of clay.” It is interesting to consider these minerals and metals not in their scriptural contexts, but from the perspectives of history, geology, and biblical archaeology. Biblical archaeologists study ancient cultural sites and artifacts to gain insight into the Bible’s Old and New Testaments. Combining archaeology with scriptural interpretation provides a clearer understanding of life as it was and the events that occurred during the biblical period, which extends more than three millennia from 3300 B.C. to the first century A.D.
Biblical archaeologists understandably focus on the Holy Land, the region between the Jordan Rift Valley and the Mediterranean Sea that now includes the State of Israel and the Palestinian territories, along with parts of Lebanon, Syria, and Jordan. Their interest also extends to adjacent areas of biblical relevance from Egypt and the Arabian Peninsula in the south to Turkey in the north and Iraq in the east. 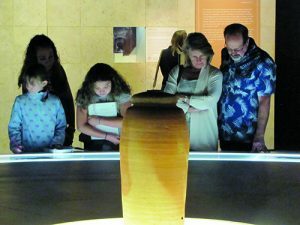 Visitors study an exhibit of the Dead Sea Scrolls on a United States museum tour; one of the original clay jars in which the scrolls were stored for nearly 2,000 years appears in the foreground. material used in tools and weapons: the Stone Age (Neolithic), the Bronze Age, and the Iron Age. The late Stone Age includes the Chalcolithic Period, a transitional subperiod in which stone and copper were used simultaneously. These cultural periods occurred at different times in different regions. In the Holy Land, the Bronze Age began about 3300 B.C. ; the Iron Age started about 1200 B.C. The Jordan Rift Valley, the northern limit of the 3,700-mile-long East African Rift System, the Earth’s largest land rift, dominates the Holy Land’s topography. 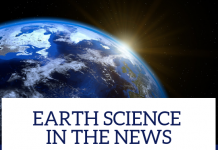 This rift system began forming 35 million years ago with a westward separation of the African tectonic plate from the Asian plate and fractured the crust into long, parallel faults. The crust between the faults subsided, sometimes thousand of feet, to create long, linear sequence of narrow rift valleys. The East African Rift System, including the Jordan Rift Valley, is still widening today. The Jordan Rift Valley extends from Lebanon south for 300 miles to the Gulf of Aqaba. Within it are the Jordan River, the Sea of Galilee, the Dead Sea (the lowest land point on Earth at 1,237 feet below sea level), and the desolate Wadi Araba, all features of biblical significance. The Bible mentions six metals: gold, silver, lead, tin, copper, and iron. Although not mined in the Holy Land, gold and silver played major roles in biblical history. The Bible mentions gold more than 400 times, and silver nearly 300 times. 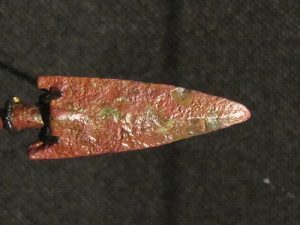 This bronze arrowhead, recovered from a site in Jerusalem, may be related to the Roman siege of Jerusalem in 70 A.D.
During the biblical period, just as today, gold served as a store of value, a symbol of wealth and prominence, and a jewelry metal. It was obtained in trade mainly from sources in Egypt, the Arabian Peninsula, India, and the Sinai Peninsula. Silver was scarce in the Holy Land until the Greeks developed the great Laurion silver-lead mines in the fourth century B.C. Silver coins such as Greek drachmas and staters, Roman denarii (the Bible’s “tribute pennies”), and Tyrian shekels, were the standard mediums of exchange throughout the greater biblical region. The Laurion mines also yielded large amounts of lead which, in the Holy Land, served as “rebar” in the construction of stone buildings. Holes drilled through adjoining stone blocks were filled with molten lead which then solidified to secure the blocks in place. The world’s first great source of tin was Kestel in the Taurus Mountains of Anatolia (now south-central Turkey), where the mining of placer and vein deposits of cassiterite or tin dioxide began about 3400 B.C. Caravans traded this tin throughout the Middle East and beyond. The Kestel ruins contain miles of narrow tunnels and dozens of small smelters that reduced cassiterite to metallic tin. Copper had a great impact on the Holy Land, and most came from the Timna Valley in Wadi Araba near Eilat, modern Israel’s southernmost city on the Gulf of Aqaba. Timna Valley copper occurs as both sulfide and oxide minerals emplaced in granite, dolostone, and sandstone. Pre-dynastic Egyptian cultures were mining these rich deposits as early as 4000 B.C. 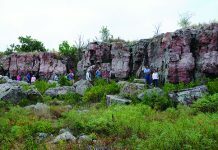 Miners initially collected nodules of copper minerals from the surface; later, they followed outcrops underground to carve out large systems of passageways and galleries. Biblical scholars have long debated how Solomon, the fabulously rich king of Israel from 970 to 930 B.C., amassed his fortune. Many believed that Solomon owned gold mines. But in the 1930s, an American archaeologist suggested that the legendary “King Solomon’s Mines” were actually the Timna Valley copper mines, an idea initially discredited because the ruins, at that time, could not be dated to Solomon’s reign. But in 2013, Israeli archaeologists accurately carbon-dated organic remains from the Timna Valley ruins to 930 B.C.—the end of the great king’s reign. Most biblical scholars now agree that copper from the Timna Valley, the world’s earliest example of systematic copper mining, was indeed the source of Solomon’s wealth. Today, the valley, a remote, arid region of spectacular pillars, arches, and canyons, is the site of Timna Valley Park and an adjacent nature preserve. 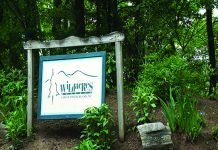 Exhibits at the park museum represent 6,000 years of copper mining. 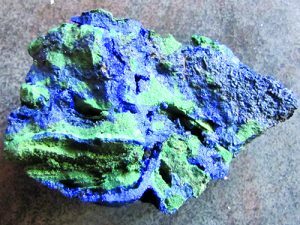 “Eilat stone,” the national stone of Israel, is from the Timna Valley and consists of intergrown masses of azurite, malachite, chrysocolla, and turquoise. of intergrowths of blue-green masses of azurite, malachite, chrysocolla, and turquoise. Specimens and polished cabochons of Eilat stone have been popular souvenirs of Israel since the nation was founded in 1948. But the specimen supply ended when the last commercial copper mine closed in the 1980s. Since then, much Eilat stone sold in Israel and abroad is actually similarly colored material from the copper mines of Africa and Arizona. About 1500 B.C., the Hittite Empire in Anatolia began smelting iron from bog iron ores. Described in the Old Testament as adversaries of the Israelites, the Hittites produced tempered, carbon-steel alloys that were harder and more durable than bronze, and could be fashioned into sharper-edged weapons. Iron weapons, armor, and chariots, the latter a landmark military advancement, soon made the Hittites a feared regional power. The Hittites zealously guarded their iron-smelting methods. When their empire collapsed around 1250 B.C., Hittite ironworkers scattered throughout the greater Mediterranean region to bring the Iron Age to various regional cultures. By 1200 B.C., iron, obtained from hematite and magnetite deposits in Syria, Anatolia, and Wadi Araba, was in widespread use throughout the Holy Land. 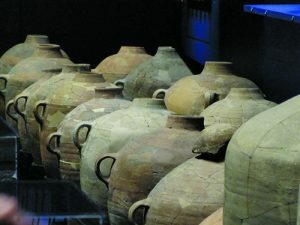 Pithos—large ceramic storage vessels—from the seventh century B.C. ; ceramics were widely used in the Holy Land throughout the biblical period. That the Bible refers to salt (halite, sodium chloride) more than 30 times is not surprising. 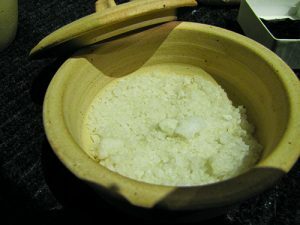 During the biblical period, salt was a widely traded commodity that was used as a food seasoning and preservative, a disinfectant, a ceremonial offering, and even a monetary-like unit of exchange. The Holy Land’s main source of salt was the Dead Sea, which is fed by the Jordan River and has no outlets. Continuous, rapid evaporation in the desert climate maintains the salinity of the Dead Sea at 34 percent, nine times higher than that of seawater. Thick shoreline salt encrustations were the first regional sources of salt. By 1000 B.C., the systematic mining of rock salt had begun at Jebel Usdum (Mount Sodom) on the Dead Sea’s northwest coast. Jebel Usdum is a five-mile-long, 720-foot-high ridge consisting almost entirely of layers of rock salt that formed 10 million years ago when seawater repeatedly flooded the deepening Jordan Rift Valley and then evaporated. Mining peaked in the second century B.C., when camel caravans regularly transported tons of rock salt to distant markets. At the southern end of the Jebel Usdum ridge, a 100-foot-tall spire of rock salt is known as “Lot’s wife,” alluding to the Old Testament account of the destruction of the cities of Sodom and Gomorrah in which Lot’s wife, while fleeing the city of Sodom, ignored God’s warning not to look back and was turned into a pillar of salt. This pitch originated as bituminous (hydrocarbon-rich) limestone. The heat and pressure of deep burial altered the bitumen into partially developed petroleum that mixed with silt and clay, lost its volatile components, and formed thick layers of natural, black asphalt. Parts of the Dead Sea floor consist of layers of pitch that sometimes floated to the surface where they were collected, cut into pieces, and shipped to markets. This fragment of the Dead Sea Scrolls was written in Hebrew between 1 and 68 A.D.; it survived only because it was stored within a ceramic jar. During the biblical period, most of this so-called “Dead Sea stone” was sold to Mediterranean shipyards as hull-caulking material. Some was traded to Egypt where it was used to waterproof papyrus boats and to Mesopotamia to serve as building mortar. Because high-bitumen pitch burned like coal, it was also used as a fuel. 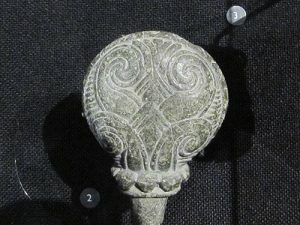 Solid, black pieces of pitch, similar in density, color, and carving properties to jet, were fashioned into ornaments. Stone carvers also worked with soapstone, or steatite. Soapstone, a metamorphic rock consisting primarily of talc, or hydrous magnesium silicate, is the softest mineral at Mohs 1.0. It has a “soapy” feel and colors ranging from off-white to grays, blues, browns, and greens. The softest and most desirable carving grades contain about 80 percent talc. Soapstone artifacts from the Holy Land include bottle stoppers, cylinder seals, beads, and figurines. Most of this soapstone came from metamorphic formations in the mountains of present-day Syria and Turkey. Colorless natron, or sodium carbonate decahydrate, was used as a soap, food preservative, medicinal compound and as a flux in glassmaking: it was obtained from evaporite deposits at the Dead Sea and Egypt’s Wadi el Nutrun. God, as in “fire and brimstone.” The English word “brimstone” is derived from the Old English brynstan, literally meaning “burning stone,” referring to its ability to burn in air. Brimstone is elemental sulfur that frequently occurs in volcanic environments, hence the Old Testament’s association with fire, hell, and God’s retribution. In biblical times, sulfur had many uses in medicine, and as a fumigant and disinfectant. Sulfur occurs at several sites in the Jordan Rift Valley which, like all rifts, has numerous remnant volcanic fumaroles and active thermal springs, some with condensate and evaporite sulfur deposits. The Bible also mentions “nitre” or natron (sodium carbonate decahydrate), which found use as a soap, antiseptic, disinfectant, food preservative, and medicinal compound. Some natron was obtained from the Dead Sea, but most came from northeast Egypt’s huge Wadi el Nutrun (Natron Valley) evaporite deposit. Utilizing its hygroscopicity, the Egyptians employed natron extensively in mummification. By 1000 B.C., natron’s most important use was in making glass, or “crystal” in the biblical terminology. Glass, which was then very valuable and even served as a gemstone, was made from silica sand, a lime stabilizer, and a natron flux, the latter to lower the silica’s melting point. By the first century B.C., new glassblowing techniques could create thin-walled glass vessels in virtually any shape. During the Roman occupation of the Holy Land, glassmakers began producing high-refraction glass by adding lead oxide to the glass mix to increase density and thus refractive index and brilliance. 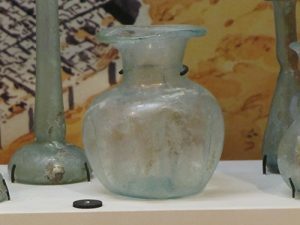 Recovered from a site at Jerusalem, this glass bottle and candlestick were made about 100 B.C. Two common, often-overlooked mineral resources of great importance in biblical history are limestone and clay. Much Holy Land bedrock is limestone, a marine sedimentary rock consisting of at least 50 percent calcium carbonate. Limestone forms when calcareous skeletal and shell remains of marine life accumulate on sea bottoms, mix with other sediments, and lithify into massive formations. Jerusalem rests atop thick formations of fossiliferous, fine-grained, oolitic limestone with buff, pink, green, and brown colors. Since the city was permanently settled around 3000 B.C., this late-Cretaceous Period limestone, now known as “Jerusalem stone,” has been used in much of Jerusalem’s construction. It was also carved into elaborate friezes, wall-relief plaques, cornices, and columns in classical-antiquity, Hellenistic, and Roman architectural styles. Cutting huge numbers of limestone blocks was accomplished with copper from the Timna Valley. Copper was hammered into flat “saw blades” which, when used in conjunction with a quartz-sand abrasive, effectively cut and shaped the blocks of Jerusalem stone. Jerusalem stone was also the raw material for making lime or calcium oxide. Finely ground stone was calcined (heated) to drive off the carbon dioxide from the contained calcium carbonate, leaving behind white lime, the primary component of masonry mortar and whitewash. The latter was used to impart a gleaming, white finish to many of Jerusalem’s greatest temples and holiest sites. 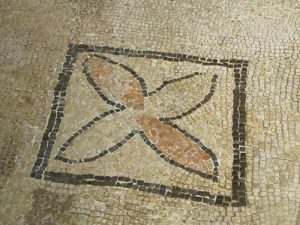 Dating to the first century B.C., this limestone mosaic was recovered from an excavated site in the Holy Land. occupation which began in the first century B.C. Stoneworkers cut colored limestone into thin, half-inch-square, inlay pieces to create elaborate mosaics for interior décor. Clay was another common mineral resource of great importance in biblical history. The term clay refers to fine-grained earths consisting of tiny particles of the hydrous aluminosilicates of sodium, potassium, calcium, and magnesium. These particles, which have sheet structures and perfect cleavage, form in surface sediments from the weathering of feldspar-group minerals. The most abundant clay minerals are kaolinite and montmorillonite. Wet clay has a plastic consistency and is easily moldable. It is mixed with various tempering or stabilizing materials, then fired in ovens where it dries, loses its plasticity, and hardens into permanent, molded ceramics. The earliest known ceramics, small effigies of animals and humans, are about 20,000 years old. By early biblical time, making ceramics had become a well-developed skill and art that produced pottery, storage vessels, funerary urns, beads, ceremonial objects, and even writing tablets. Recovered from a site in northern Israel, this soapstone bottle stopper dates to the seventh century B.C. Ceramic writing tablets have preserved many examples of cuneiform, the earliest system of writing developed by the Sumerians around 4000 B.C. Later, ancient Hebrew, Aramaic, Phoenician, and Hittite texts were also preserved on ceramic tablets. Writers used styli to impress characters into soft, wet clay which was then fired into durable tablets. Many priceless biblical artifacts have survived within ceramic jars. One of the best-known examples came to light in 1947, when a Bedouin herdsman discovered caves in the limestone cliffs along the northwestern shore of the Dead Sea. These caves contained ceramic jars holding one of the 20th century’s greatest archaeological discoveries—the Dead Sea Scrolls. The scrolls are written mostly on parchment, with a few inscribed on papyrus and one on a copper sheet. Dated from 250 B.C. to 68 A.D., they are written in Hebrew, Aramaic, and Greek. These fragmented scrolls, more than 900 in all, are a record of the customs, rituals, and religious beliefs of the ancient Israelites. 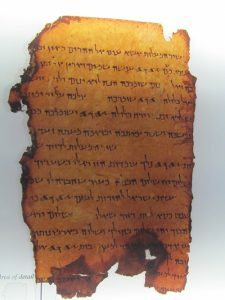 Just over 200 of the scrolls are partial or complete copies of Old Testament manuscripts; one is the earliest such manuscript known to exist. Without the protection of clay jars, archaeologists believe none of the scrolls would have survived. 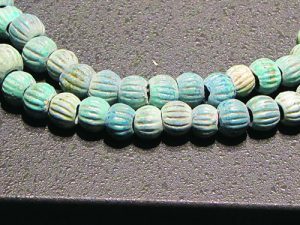 Along with minerals and metals, the Bible also mentions gemstones, notably those of the sacred breastplate of the high priest of the Israelites. Familiarly known as “Aaron’s breastplate” or the “breastplate of judgment,” this golden breastplate was set with 12 different gemstones representing the 12 tribes of Israel and dates roughly to the 14th century B.C. Glass was a valuable material in biblical times and even served as a semiprecious gemstone. 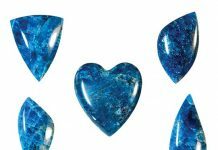 centuries as the original ancient Hebrew text was translated into Greek, Aramaic, Latin and, finally, English, the gemstone identities have become uncertain. But new interpretations of Old Testament scripture combined with modern archaeological and mineralogical data, along with historical information about the availability and sources of specific gem materials during the early biblical period, is providing new ideas about the identity of the breastplate gemstones—a topic that will be discussed in a future article.